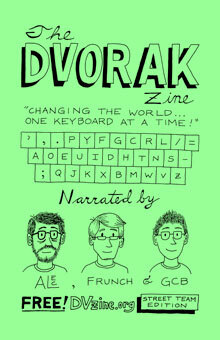 "The Dvorak Zine" is a 24 page zine that uses the power of Comics to promote the Dvorak Simplified Keyboard Layout. On this site you will learn about the history of Dvorak, how to set it up on your computer and plenty of links exercises and typing tutors to help you start typing Dvorak today! We're changing the world... one keyboard at a time!! From now on we will be making all updates for this site in the Dvorak Zine Blog. This will make it easier for people to keep track of updates (using our RSS feed) and now you can comment on, share and reblog our posts. Please help us spread the word about the Dvorak Simplified Keyboard Layout!